When undoing, Aba will warn you if some file was changed since the replacement. You may want to apply these changes to the old version of the file, or to discard them. The right pane shows the changes in the file selected in the left pane. Aba uses the console file comparison tool specified in Options. You can press Merge changes to run a merge tool (also specified in Options). If a file is checked in the left pane, the recent changes in it will be discarded and it will be overwritten with its backup. If the file is not checked, it will not be undone and will be left as is. 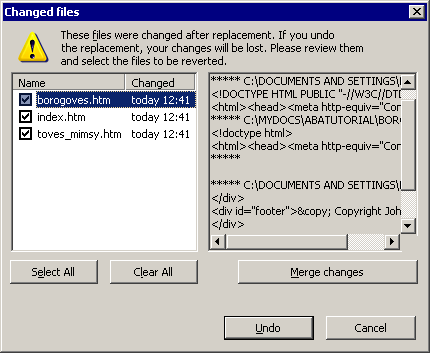 If you have an external merge tool and press Merge changes, you can merge the changes with the old version of the file, so that you will undo the replacement and preserve your changes. In this case, the file will also be unchecked. The file is automatically unchecked when the window is open and you change the file (by running the merge tool or by manual editing). So, the changed file will not be overwritten with its backup. You can press Select All to discard the changes in all modified files, and Clear All to left all the files as is.